Today, I am sharing a project and tutorial with this pretty bird. Sentiment: Just you doing you makes you beautiful. I made this card a while back, but I am just getting around to sharing it here. It reminds me of my mama. I just love the bird silhouette and the awesome sentiment together. Supplies: Unity Stamp Co. You Make You, ColorBox ink, Winnie and Walter dies, Misti, Ranger ink and embossing powder and heat tool. Here is an inspirational boho style embossed card. Sentiment: What's meant to be will always find its way. This card features artsy circles with ombre colors. I like the butterflies in them. I made a quick tip video for this project. 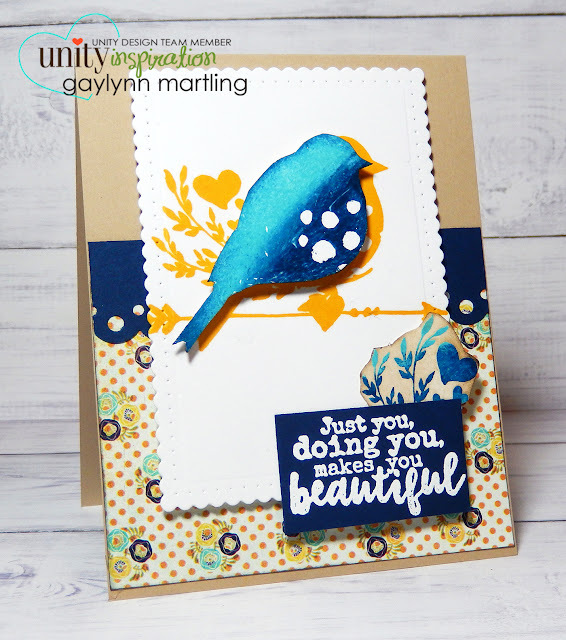 Supplies: Unity Stamp Co. Love What's Meant To Be by Susan Weckesser, ColorBox ink, MFT die-namics and Misti. If you would like for me to share a particular crafty technique, please mention it. It is new release time at Unity, and this gold embossed rose card was created with one of the newest kits. Sentiment: You are lovely. You are inspiring. You are beautiful. 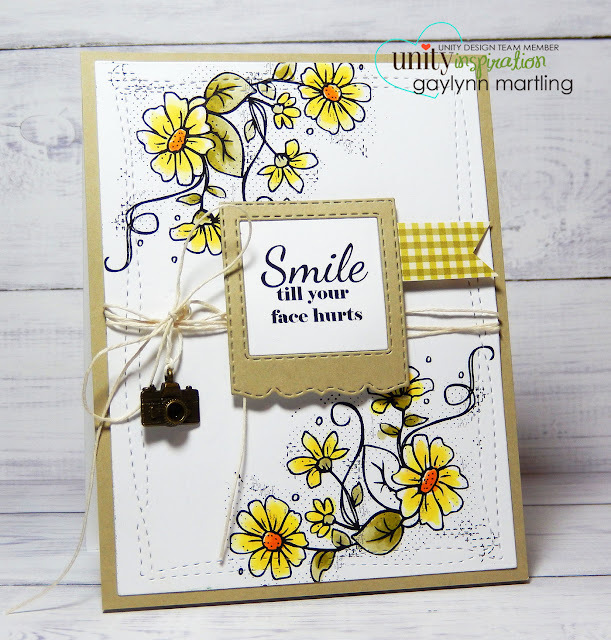 This is two step stamping and a quick tip video tutorial follows. I am very happy to see the production of florals with coordinating layers. The possibilities are endless with these roses. 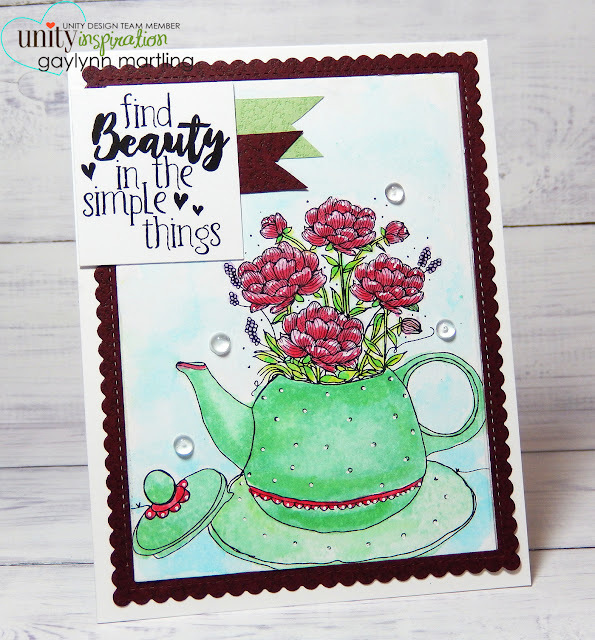 Supplies: Unity Stamp Co. You Are This, Winnie and Walter dies, Simon Says Stamp cardstock and embossing powder. An inspirational teapot card for today. Sentiment: Find beauty in the simple things. I am a tea lover. However, I have never used a teapot as a planter or vase. Good idea though. The teapot is paired with an inspirational message that I love. Watercolor with oil pastels, droplets and a simple frame finished it. I was going for the look of green milk glass, by mixing colors. It comes close, but not what I intended. It does come close to the color of the year though. ~ Greenery. Here is a quick tip video tutorial for blending water soluble oil pastels as watercolors. I hope this inspires you to think outside the box, get a little messy and try making new colors now and then. Supplies: Unity Stamp Co. Pretty Darn Amazing March 2017 KOM, Prima water soluble oil pastels, MFT die-namics, Pretty Pink Posh droplets and Ranger watercolor paper. Hi there, it's Gaylynn. Today we are hopping with the Unity Stamp Co. design team and featuring lots of new release projects. This is a special graduation invitation project. My baby girl is graduating college. I am a so very proud of her. This is a sample of her party invites. I made a video tutorial sharing ways to attach vellum. There is a lot going on at the Unity store. Don't miss out. 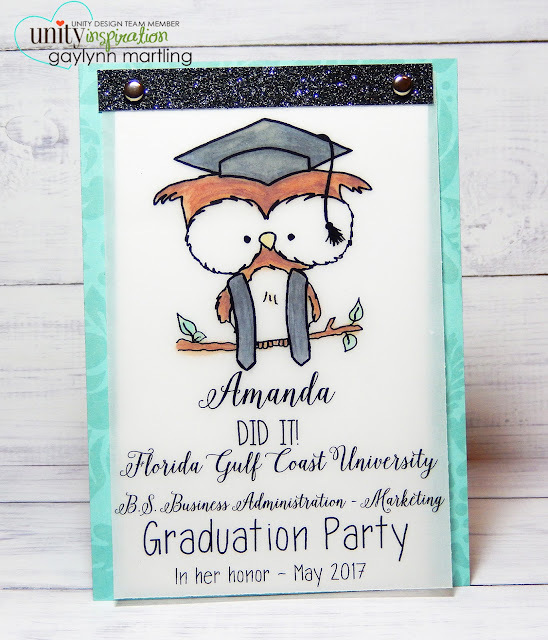 I used this cute kit called Owl Graduate. And hop along with us for lots of inspiration. A fun card with flowers and a camera. Here is a camera themed card with flowers and a FUN sentiment. Sentiment: Smile till your face hurts. The background was created by using the image in multiples, then using Copic markers for color. I though that this fun sentiment needed to be showcased. With a little frame, flag, twine and a tiny camera charm, it all came together perfectly. This is great for congratulations, birthday, friends, family and celebration occasions. Here is a video tutorial for it. Supplies: Unity Stamp Co. Smile In Your Dreams, dies by Avery Elle and My Creative Time, camera charm, twine and Copic Markers.